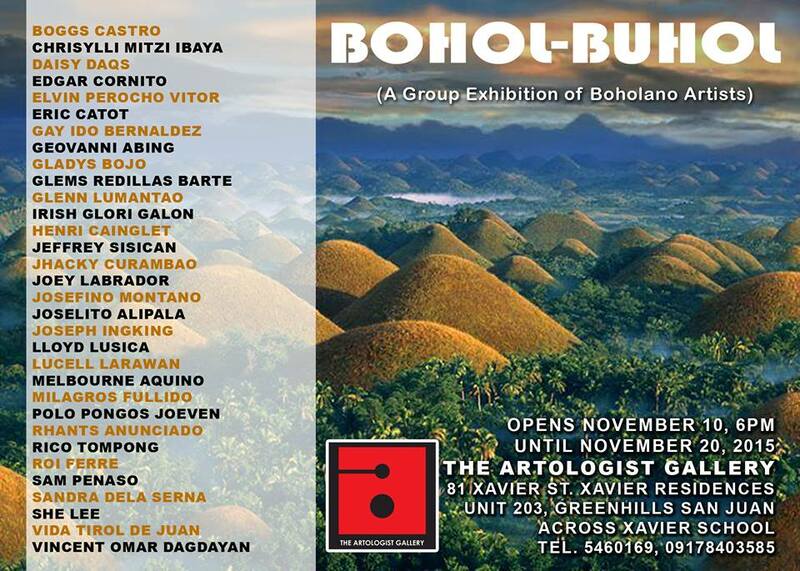 The featured artists in BOHOL-BUHOL are a vibrant mix of established artists who were natives of Bohol who are now based in Manila and have successfully exhibited in the Philippines and abroad, and of emerging artists some of whom are still based in their native hometown. The exhibit showcases the wealth of Boholano artistry spanning a healthy breadth of genres from realist works that stress the island’s natural wonders to abstractions that have challenged the works of contemporary artists in the country and the world. 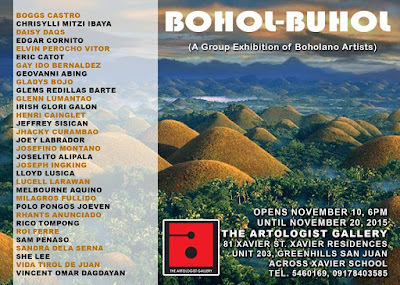 Artologist Gallery presents BOHOL-BUHOL: A group exhibition of Boholano artists, namely: Boggs castro, Rhants Anunciado, Eric Catot, Edgar Cornito, Jhacky Curambao, Roi Ferre, Irish Glori Galon, Joey Labrador, Glenn Lumantao, Henri Cainglet, Sam Penaso, Rico Tompong, Jeff Sisican, Melbourne Aquino, Chrisylli ibaya, Daisy Daqs, Elvin Vitor, gay bernaldez, Geovanni abing, Gladys bojo, Glems barte, Josefino montano, joselito alipala, Joseph ingking, Lloyd lusica, lucell larawan, Milagros Fullido, polo joeven, Sandra dela serna, she lee, vida tirol de juan, Vincent omar daydayan.